The City of Winter Park has some wonderful architecture from the 20th century like Casa Feliz and the Spanish Revival buildings on the Rollins College campus. A fairly affluent community, Winter Park has the means to preserve historic structures so they can be enjoyed by future generations. The city doesn't seem to have much regard, however, for structures built in the mid-twentieth century. 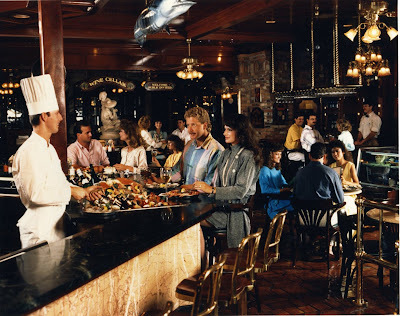 First, they demolished the wonderful Langford Resort Hotel, Central Florida's most glamorous resort for many years. Now in an effort to create more park space, they are considering tearing down the mid-century modern post office built in 1965. The Orlando Sentinel published an article last week about the proposed expansion of Central Park, the city's wonderful stretch of green running most of the length of Park Avenue, parallel to the railroad tracks. The article focuses mainly on the fact that $4 million dollars would need to be raised to expand the park, and "professional fundraising consultants and media relations people" have been hired to make this happen. The part of the article that got my attention was this: "relocating the New York Avenue post office to the northern edge of the park and moving the postal distribution center out of the downtown core." I got the impression from reading minutes from the Winter Park City Commission meeting in August, that city leaders have embraced the idea of moving the customer service portion of the post office to somewhere else near Park Avenue. As the Postal Service nationwide struggles to remain viable, and post offices are are used less and less, this is not surprising. The most interesting aspect of this particular post office are the murals on two sides of the building. I don’t know if you would call them mosaics because they appear to be painted rock. The wonderful abstract design is very typical mid-century modern and was created Tampa area artist Joe Testa-Secca. 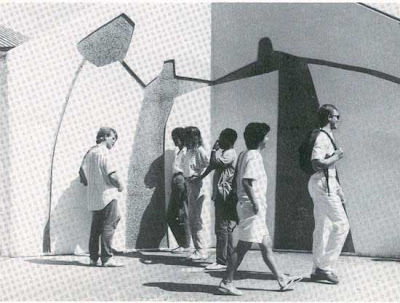 The winner of the Best of Show award at the Winter Park Sidewalk Art Show in ‘65, Testa-Secca also has completed murals on the University of South Florida campus. This decoration on the Department of Chemistry at USF is described this way" bas relief murals (symbolizing "Man's relationship to man") created by Joe Testa-Secca." When I contacted the public relations firm in charge of raising the money, they offered very little information. While I understand that a full service post office may no longer be necessary in Winter Park, (an online comment on the Sentinel’s story said 52% of respondents favored keeping the Post Office), I wonder if they’d consider somehow incorporating the murals into the new park space. They are a wonderful time capsule into the aesthetics of the 1960s and would make a great backdrop or even a focal point for an outdoor area. Overall Central Florida has done a lousy job of preserving resources from that era, and while many don’t appreciate that aesthetic now, perhaps future generations might enjoy it in the same manner we love the architecture of James Gamble Rogers II today. 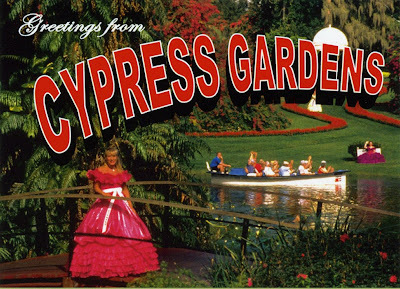 Cypress Gardens closes... for good? 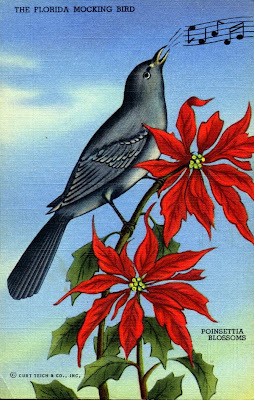 There is no doubt that the mockingbird has one of the prettiest songs in the animal kingdom. And they are fun to watch, as the animated songbird is extremely active. But the official Florida state bird is very common, not just in Florida but throughout the entire Southeast. Actually four other state share the mockingbird as their official state bird. Recently Florida students voted for a new state bird and they picked the Osprey, according to an article in the St. Pete Times. I love watching Ospreys dive for fish and they are truly magnificent creatures. But according to Wikipedia, "The Osprey has a worldwide distribution and is found in temperate and tropical regions of all continents except Antarctica. In North America it breeds from Alaska and Newfoundland south to the Gulf Coast and Florida, wintering further south from the southern United States through to Argentina." 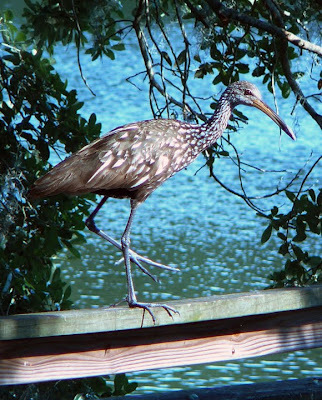 Based on uniqueness to Florida alone, my vote for state bird would be the Limpkin. In the US the Limpkin's main habitat is peninsular Florida. 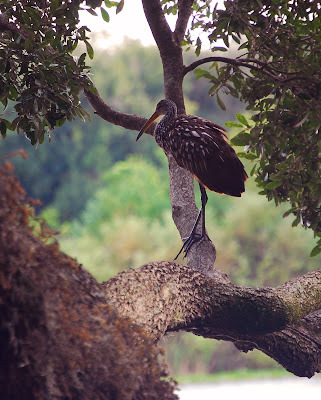 According to the Wakulla County, Florida website, "Limpkin were hunted almost to extinction in Florida by the beginning of the 20th century, but with legal protection is making a fair comeback." The Limpkin's primary food the apple snail, is an indicator of water quality. So as the water quality decreased at Wakulla Springs, so has the number of Limkins. So they are an excellent litmus test of man's impact upon the environment. When we moved to our house on this little lake 6 years ago, the cry of the Limpkin was a persistent reminder that we lived on the water. But this year it had been quiet and I feared that the septic tanks and fertilized lawns around the lake had maybe wrecked the water quality to the point it would no longer support apple snails and fresh water mussels. But just last week the loud distinctive cry of my favorite Florida bird rattled my house at 4 am and I suspect that higher water levels were to blame for its disappearance. 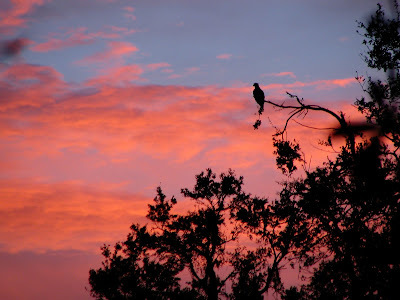 Although I didn't appreciate the early wake up call, I enjoy the reminder that Florida was once a wild, untamed land and glimpses of that past are still available. One of my favorite characteristics of Limpkins is they have seem to possess an unflappable attitude and are fairly tolerant of people. They have dark large soulful eyes and are one of the few wading birds that will allow you to get close enough to make good eye contact. After looking into the eyes of one of these loud Florida natives, I am more determined than ever to try to ensure they have a healthy place to live in Florida, far into the future. 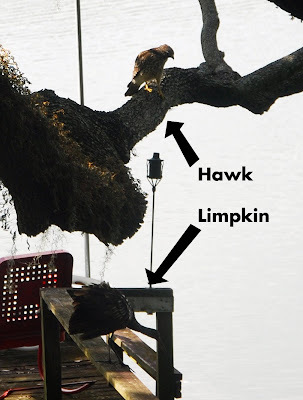 I recently witnessed this confrontation between a hungry hawk and a cool Limpkin who would have no part of the hawk's attempts to turn it into lunch. Eventually the Limpkin chased the hawk away! I recently had the opportunity to review items that will be put up for auction from Church Street Station. 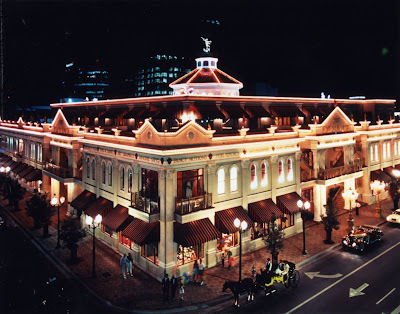 The downtown Orlando complex formerly highlighted antiques collected by its founder, Bob Snow. Over the years he amassed an amazing collection of antique automobiles, architectural elements, furniture, paintings, sculpture, etc. He also hired a talented woodworking crew to create hand-crafted quality wood pieces that helped to integrate the antiques into the attraction in a seamless manner. Bob Snow sold Church Street Station to Baltimore Gas and Electric who tried for years to make it a profitable operation. When they tired of trying to re-coup their large investment they unloaded it and a series of bad owners insued, each one seemingly worse than the last. Finally recording industry mogul Lou Perlman, who ultimately ended up in prison, cannibalized much of what was left of Church Street. And what he did with Church Street Station's furnishings was a crime as well. The newest building on the complex was a 3 story shopping mall called The Exchange built in 1988. Beneath this beautiful Victorian structure was a basement used for storage and the uniform department when the attraction was in its prime. Mr. Perlman, who embezzled millions from his clients, piled all the furnishings, antiques and contemporary pieces, 6 feet high in the basement. Many incredible items were damage beyond repair. The person in charge of cleaning up Perlman's mess and preparing salvageable material for auction, is an acquaintance of mine who knew me from my almost 9 years of working at Church Street Station. Thinking that I might find sentimental value in some of the ephemera that would be thrown away, she allowed me to peruse room after room of what is left. Hundreds of chairs, tables, lamps, and paintings await auction. Seeing the potential to collect material to document this sliver of Orlando's history, I brought the curator from the History Center with me as well. I salvaged some collateral and ephemera, but more importantly we were able to find some interesting artifacts for the History Center. So I guess this leads me to question whether I am trying to hold on to the past by collecting old postcards, photos and menus from this an attraction that will more than likely never re-open again? 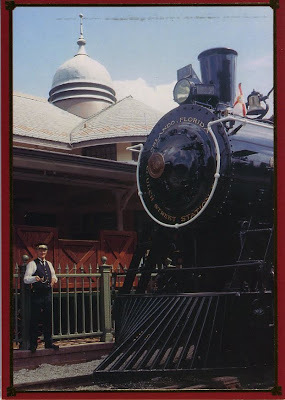 As an avid collector of ephemera from old Florida attractions, I say while I may be sentimental, there is a tangible value in preserving reminders of this significant era in Orlando's past. Over its 30 year run thousands of people visited the attraction and made priceless memories there. Couples got married in its beautiful showrooms. The banquet rooms were sites for political rallies and several presidents visited. Legendary entertainers played on its stages, from the Allman Brothers to Tammy Wynette. For a time Church Street Station was the heart of the city. And mementos of that provide a unique window into an incredible time to have lived in Central Florida. Postcard with "Old Duke" locomotive and "Al Aboard" the train conductor. The locomotive has reportedly been sold. 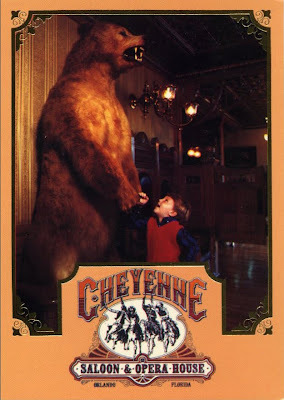 This stuffed Grizzly Bear once greeted guests at the entrance to the Cheyenne Saloon but was badly damaged beyond repair before the Cheyenne briefly re-opened recently. Crackers Oyster Bar and the Wine Cellar in the background. Cellars are extremely rare in Central Florida due to the high water table. 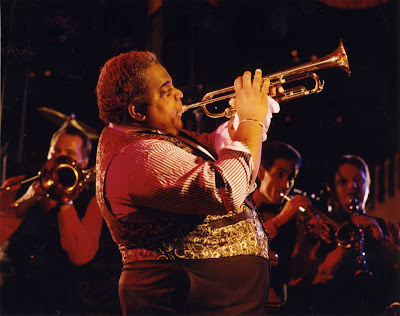 Bill White performed his Louis Armstrong tribute in Rosie O' Grady's Goodtime Emporium nightly. This elaborate stained glass window was purchased by the Orlando Magic for the new arena. 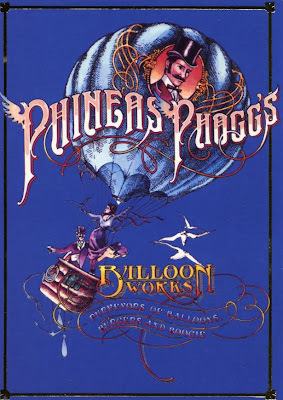 Phineas Phoggs Ballloon Works was a discoteque where Michael Jackson would visit incognito after his trips to Disney and where Charles Barkley hurled a patron through a plate glass window. 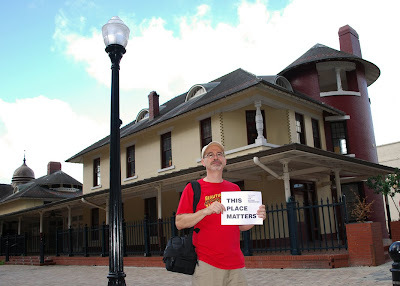 The century old train depot is one of Orlando's most historic structures. This sign once hung outside of Lili Marlene's Aviator's Pub and Restuarant which for many years was one of the highest grossing restaurants in the entire United States. Top of a custom made trade show booth for the attraction, which now has a new home in the Orange County Regional History Center. 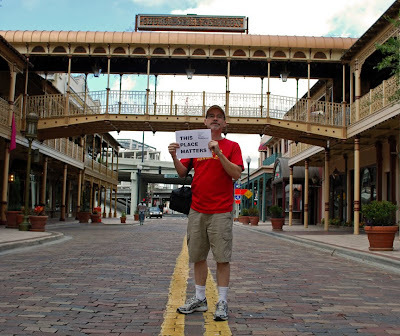 "Church Street Station represents the past, and Orlando cannot afford to live in it. St. Augustine and Savannah can but not our city." So concludes Mike Boslet, editor of Orlando Magazine. He continues: "So what can be done to Church Street Station? Simple: Encourage a developer to tear it down and build a modern, glass-encased, commercial low-rise on the site." 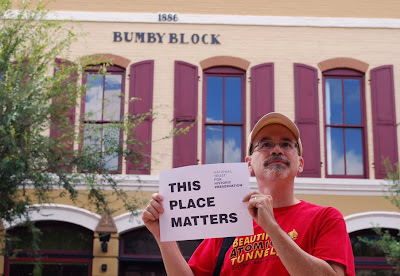 Stepping into the biggest preservation controversy Orlando has known, the abrupt distruction of the Jaymont block, Mr. Boslet says: "It’s not like the city hasn’t aided the demolition of an outdated piece of property before. The city expedited approval of Kuhn’s request to bulldoze the old Jaymont block in 2003. Mayor Buddy Dyer made that happen. 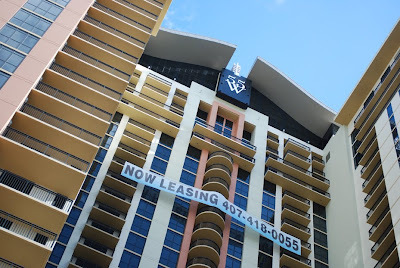 Today a beautiful, albeit financially troubled, three-tower, commercial-residential condo development called The Plaza stands on Orange Avenue between Church and Pine streets. The old department store it replaced sat there for 60 years, the last two decades derelict. Does anyone really miss it?" My answer is yes, I miss it. While the drug store that anchored the block (I forget if it was Woolworths or McCorys) had moved out, it was not derelict for 2 decades as he claimed. The Historic Preservationist for the city was working to preserve the building, but was blindsided by Orlando's mayor and the wrecking ball started swinging within minutes of the city council vote. In its place is a hollow condominium with few residents and bad art. 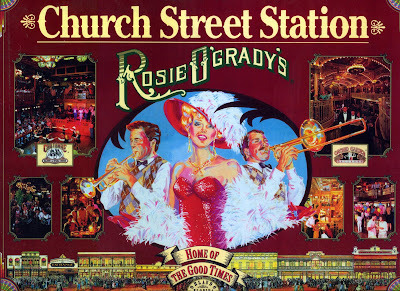 The premise of tearing down Church Street Station and the whole attitude of the editorial is prevalent in Central Florida. I often hear people complain about the lack of culture or history here, yet eagerly anticipate the arrival of any new chain store or franchise restaurant. 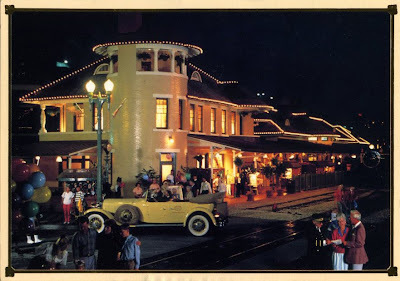 I wrote the editor and urged others to do the same because the block occupied by Church Street Station, not only was home to one of Orlando's most successful attractions, it also has some of our oldest buildings. The story goes that when Bob Snow, owner of Rosie O'Grady's in Pensacola, heard Disney was coming to Orlando, he came to Orlando looking for a site to build a "Rosies" here. He had little luck but on the way to the airport the cab driver drove him down Church Street and he found exactly what he was looking for. On the corner was the building formerly housing Slemons Department Store, built in 1926. Other vintage buildings included the Bumby Hardware Store, built by one of Orlando's pioneering families in 1884 and one of the oldest surviving commercial structures in town. Just across the railroad tracks is the historic train depot, which is on the the Historic Register. I think it's unlikely that the attraction that was Church Street Station can ever exist again. But the buildings that housed "the home of Good Times" have more character and life left in them than any "glass glass-encased, commercial low-rise." Looming just beyond the Train Depot is a high rise condo known as 55 West. It is brand new and completely empty. 129 W. Church St. originally Slemons Dept. Store, later Rosie O' Grady's, now vacant. "Built 1884, the Bumby Hardware is one of Orlando's earliest surviving commercial buildings." Old Railroad Depot, Built 1889. 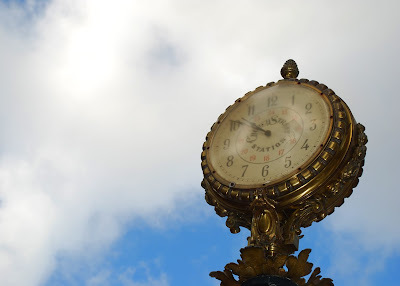 "...reflects the Late Victorian railroad architecture popular among New Englanders who funded the railway enterprise. The smooth undulating roof lines, eyebrow dormers, circular tower and bulbous column of the 2nd floor relate to the style developed by architect HH Richardson of Boston..."
My anger at this point of view expressed in the editorial, led me to the National Trust for Historic Preservation's website where I found and participated in the "This Place Matters" campaign. Here are some of the places that matter most to me. The Rogers Building, built 1884 . Originally was the English Club for English settlers in the Conway area. Currently an art gallery. On the Historic Register. The Orange County Regional History Center, built 1927. Originally the the Orange County Courthouse, designed by architect Murry S. King, Florida's first licensed architect. On the Historic Register. Orlando Public Library built 1966. The Brutalist style building is often criticized by residents for its stark appearance. Expansion in the 1980s was handled by Nils Schweizer, protege of Frank Lloyd Wright. 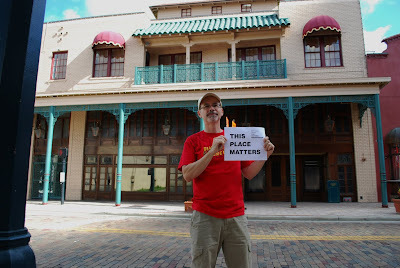 Last week I found inspiration for preservation in downtown Orlando. Central Florida is the lightning capital and frequent summer storms mean unplugging electronics in case of a lightning strikes. I worked a place in Gainesville where a nearby lightning strike fried all the computer equipment and I'll never forget the image of fried computer monitors stacked up in the hallways. So it makes perfect sense that a large object sticking up in the middle of a lake would be huge target for lightning. 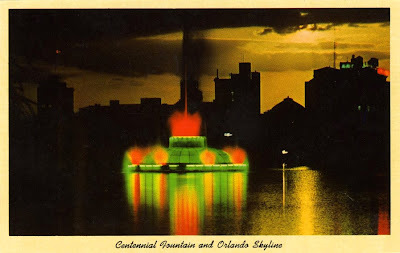 And that's what happened last week to Orlando's unofficial landmark, the fountain in Lake Eola. It couldn't happen at a worse time as the current financial situation is affecting the City of Orlando in a negative way and they are considering drastic cuts like laying off firefighters. So almost immediately sides were drawn between those wanting to raise the funds to restore the landmark and those seeing the opportunity to be rid of it, once and for all. 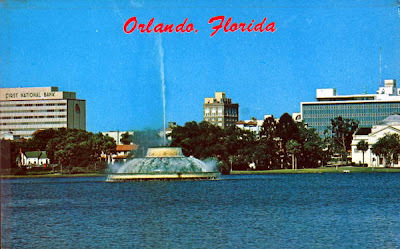 "The Orlando Centennial Fountain was formally dedicated on October 5, 1957. W.C. Pauley, an Atlanta landscape artist, was paid $1,200 for his plans, and the total construction cost was $162,000. It was built in 24-foot deep water by driving 28 60-foot long steel cylinders, which were then filled with 320 tons of concrete. It is not in the center of the lake to avoid a very deep sinkhole located there." A spectacular display of everchanging colors and continually changing water spray effects. Sixty feet in diameter, teh fountain uses 2,900 gallons of water per minute." The years have taken a toll on the 52 year old landmark that adorns the city seal and street signs. So the fountain as we know it today, is not nearly as colorful or animated as the original light and water show put on originally. And without water, it looks like a poorly -constructed green UFO sitting in the middle of a lake. Many don't see the value of the mid-century marvel, but it is a symbol of the city from its pre-Disney days. As the city exploded with growth after the Mouse came to town, those with ties to the real city here, became fewer and fewer. So for many, the fountain is just an old ugly thing the middle of the lake that breaks down all the time. 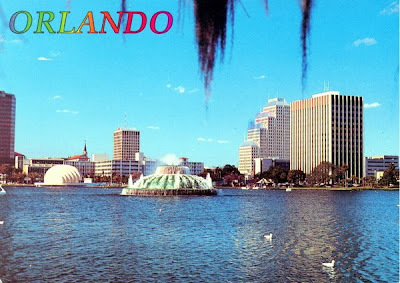 And still others never even venture into downtown Orlando. I see it as one of the few signs that a city existed before we became a theme park mecca, and that generations before us strove to make this place a good place to live. It shows that this city has a soul. And to me that's a symbol worth saving.